Antiabortion policymakers have escalated their attempts to bar Planned Parenthood from publicly funded programs, including the Title X national family planning program. If social conservatives were to succeed in cutting Planned Parenthood and similar providers out of the nation’s publicly funded family planning effort, the remaining providers would not be able to readily serve all of the women in need of such care. In recent months, social conservatives have doubled down on various long-standing proposals to deny public funding to Planned Parenthood and other providers focused on reproductive health. This includes efforts by Congress and the Trump administration to bar Planned Parenthood from receiving funding through federal programs—including Medicaid and the Title X national family planning program—as well as attempts to eliminate or reshape Title X, based on the premise that the program indirectly subsidizes abortion. Proponents of such restrictions are ultimately seeking to make abortion inaccessible for U.S. women, and so are seeking to shutter Planned Parenthood health centers and any safety-net health center providing publicly funded family planning services that additionally offers abortions (using other funds), or is affiliated with an abortion provider. However, the consequences of these proposals reach far beyond abortion. Nationwide, Planned Parenthood health centers serve two million (32%) of the 6.2 million women who obtain contraceptive care from some type of safety-net family planning center.1 And 1.6 million (41%) of the 3.8 million contraceptive clients served by Title X–funded providers are served at Planned Parenthood health centers. Recent analyses conducted by the Guttmacher Institute have looked at the impact of four different scenarios that align with many of the specific antiabortion policy attacks that have been proposed at the federal and state levels. Each scenario would radically undermine the nation’s family planning safety net and blatantly jeopardize women’s access to family planning care. Scenario 1: Exclude Planned Parenthood from all publicly funded programs. For many years, social conservatives have sought to exclude Planned Parenthood health centers from receiving any type of public funding—whether in the form of grants specifically for the provision of reduced-cost or free family planning and other services, as under the Title X program, or in the form of reimbursement for services provided, as through Medicaid. President Trump’s fiscal year 2018 budget proposal takes this broad approach, cutting Planned Parenthood off from all federal programs—including Title X, Medicaid and many others—that its health centers rely upon to deliver affordable health care services. In this scenario, women who currently depend on Planned Parenthood would be left to seek care elsewhere. 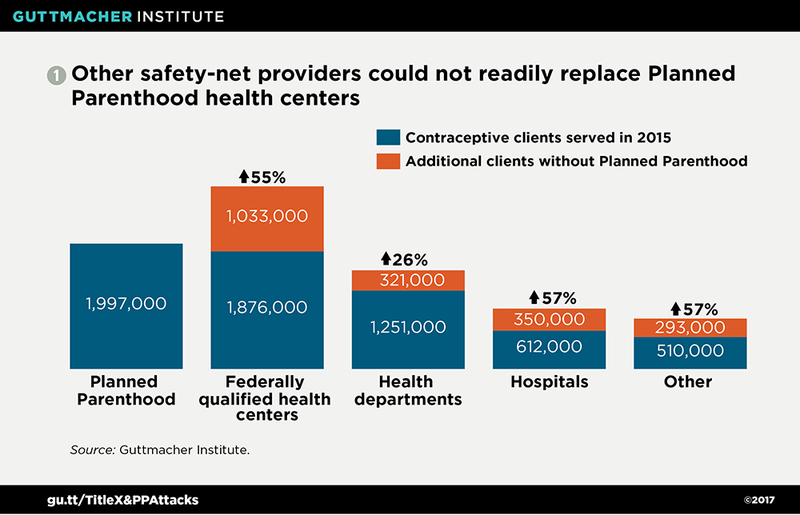 In order to serve all the women currently obtaining contraceptive services at Planned Parenthood health centers nationwide, other types of safety-net family planning providers would have to increase their client caseloads by 47%, on average.2 Federally qualified health center (FQHC) sites offering contraceptive care, hospital sites and others would have to increase their capacity by more than half (see chart 1).2 Sites operated by public health departments nationwide would have to increase their contraceptive client caseloads by a lesser proportion. Nevertheless, they still would have to take on hundreds of thousands of additional clients. Health departments have long been under-resourced and are often already stretched thin when it comes to maintaining the public funding and capacity necessary to meet the needs of their communities. Scenario 2: Bar federal funding to Planned Parenthood, with the expectation that FQHCs can fill the gap. In justifying their efforts to exclude Planned Parenthood health centers from participating in public programs, many social conservatives have argued that Planned Parenthood health centers are not necessary because FQHCs are ubiquitous and could readily meet the demand for family planning services. Such claims often come with promises of additional funding for FQHCs. Most recently—and visibly—social conservatives in Congress have included such proposals in their efforts to repeal the Affordable Care Act (ACA), pairing a provision that bars Planned Parenthood from Medicaid with another that allocates new money for FQHCs. This adds up to unrealistic expectations for FQHCs if Planned Parenthood were cut out of the family planning safety net. 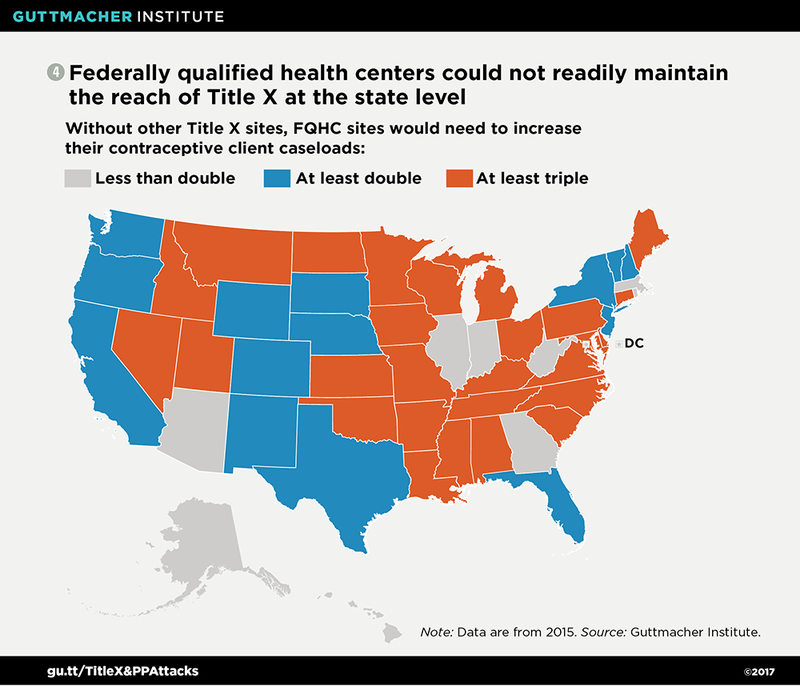 In 27 states, FQHC sites that offer contraceptive care would have to at least double their contraceptive client caseloads, and in nine of those states, they would have to at least triple their caseloads (see map 2).3 Nationwide, this would mean taking on an additional two million contraceptive clients. The challenges are also clear at the local level. 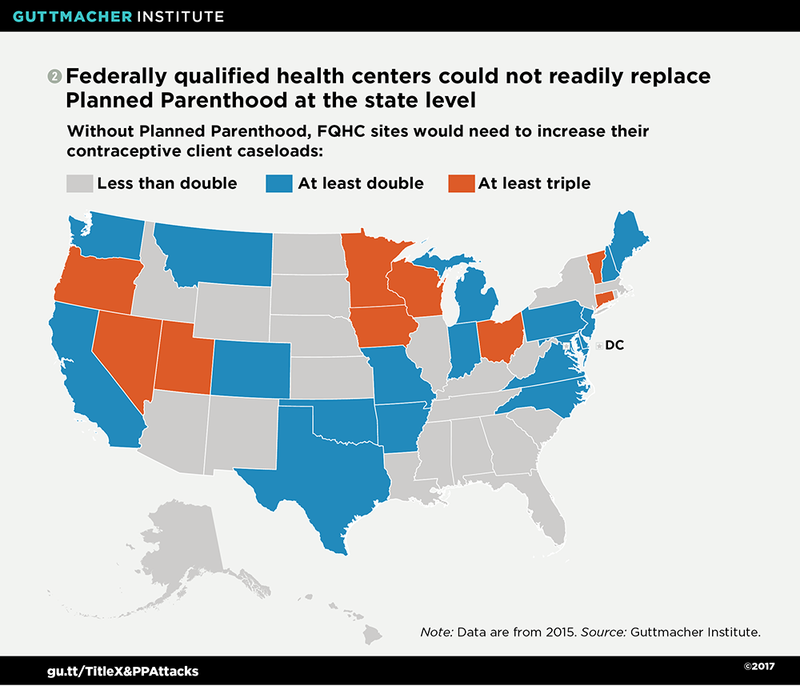 In 80% of the 415 U.S. counties with Planned Parenthood health centers, either existing FQHC sites offering contraceptive care would have to at least double their capacity, or there simply is no FQHC site providing these services.3 This scheme stands to have the largest negative impact on the 1.7 million (85%) of Planned Parenthood’s contraceptive clients served in those counties. Scenario 3: Exclude Planned Parenthood from Title X. The federal Title X program is the backbone of the nation’s publicly funded family planning effort. Despite a prohibition on the use of Title X funds for abortion services that has been in place since the program’s inception, antiabortion policymakers have targeted the program as indirectly supporting abortion; they have repeatedly sought to restrict Title X funds from going to entities associated with abortion, often specifically Planned Parenthood. This tactic, which has been replicated in many states, prompted the Obama administration to issue regulations that clarified states cannot exclude otherwise qualified abortion providers from the Title X program (see “Recent Funding Restrictions on the U.S. Family Planning Safety Net May Foreshadow What Is to Come,” 2016). Congress and President Trump have since overturned those regulations. This translates into Title X–funded FQHC sites having to more than double their contraceptive client caseloads, while Title X sites operated by hospitals would have to increase their caseloads by about three-quarters (see chart 3).2 Title X–funded health department sites would need to expand their capacity to deliver contraceptive services by about one-third. Collectively, these additions represent hundreds of thousands of women who currently obtain care at Title X–funded Planned Parenthood health centers—most of whom are low-income and uninsured, relying on Title X for reduced-cost or free care. Again, how this change would impact other Title X providers varies by state. Without Title X–supported Planned Parenthood sites, other Title X providers in 27 states would have to increase their contraceptive client caseloads by at least 20%.2 In 13 of those states, other Title X providers would have to at least double their capacity—and in many, to an even greater degree—to maintain the current reach of their states’ Title X networks. Scenario 4: Eliminate or restructure Title X to shift funding to FQHCs. Antiabortion policymakers have also suggested drastically undermining or outright eliminating the Title X program by directing all current funding to FQHC sites. This comes at the expense of not just Planned Parenthood, but all providers focused on reproductive health. State policymakers have been pursuing this goal for years, and socially conservative members of Congress may well carry their current rhetoric through to the illogical conclusion that Title X funds should go only to entities offering primary care, excluding the very providers often best able to provide high-quality family planning and related services to large numbers of people. 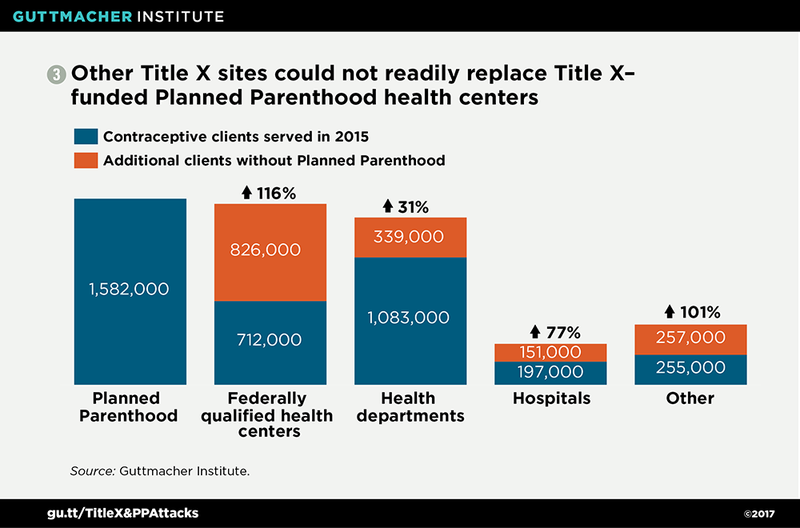 Guttmacher’s research shows that FQHC sites alone could not sustain the current reach of Title X. If asked to serve all of the women who rely on many different types of providers for Title X–supported services, FQHC sites providing contraceptive care would have to at least double their contraceptive client caseloads in 41 states (see map 4).3 In 27 of those states, these FQHC sites would have to at least triple their capacity. Nationwide, this adds up to an additional 3.1 million clients. At the local level, there are Title X–funded providers in about 2,000 U.S. counties.3 In one-third of those counties, there is no FQHC site providing contraceptive care, and in about half of them, FQHC sites that offer contraceptive care would have to at least double their contraceptive client caseloads. Collectively, 2.8 million (91%) of the contraceptive clients currently served at Title X sites other than FQHCs are in one of those two categories of counties and would face the most considerable burdens in obtaining Title X–supported care. Policymakers should put sound policy decisions above political expediency. Despite social conservatives’ ploys to make Planned Parenthood and even Title X appear expendable, the facts prove otherwise. An abundance of evidence demonstrates how important Planned Parenthood health centers are for a large proportion of women who need publicly funded family planning services (see “Understanding Planned Parenthood’s Critical Role in the Nation’s Family Planning Safety Net,” 2017). Moreover, the health and economic benefits made possible by a robust Title X network have been well documented (see “Why We Cannot Afford to Undercut the Title X National Family Planning Program,” 2017). It is high time that congressional leaders, President Trump and his administration stop pushing ideologically motivated policies and misleading talking points, and instead focus on implementing policies that will advance access to high-quality reproductive health care. This means investing in proven public health programs and providers, by adequately funding Title X and abandoning the shortsighted campaign to cut Planned Parenthood off from participation in publicly funded programs. Doing so would be a step toward the types of investments and policies that the millions of women who rely on a diverse, robust network of safety-net family planning providers need and deserve. 2. Frost JJ and Zolna MR, Response to inquiry concerning the impact on other safety-net family planning providers of “defunding” Planned Parenthood, memo to Senator Patty Murray, Senate Health, Education, Labor and Pensions Committee, New York: Guttmacher Institute, June 15, 2017, https://www.guttmacher.org/article/2017/06/guttmacher-murray-memo-june-2017. 3. Frost JJ and Zolna MR, Response to inquiry concerning the availability of publicly funded contraceptive care to U.S. women, memo to Senator Patty Murray, Senate Health, Education, Labor and Pensions Committee, New York: Guttmacher Institute, May 3, 2017, https://www.guttmacher.org/article/2017/05/guttmacher-murray-memo-2017.